This site serves as a contact point for friends & family; A brief documented glimpse into the world of Zom. Tales of our experiences abroad, photos of happenings around the globe & general ramblings about life, friends, food and foreign culture. If you happened across this site by accident, you're very welcome to poke around ... we'd love to hear your thoughts. We met in ~1998 through common friends and intrigue for (amongst other things) underground electronic music and motorcycles. 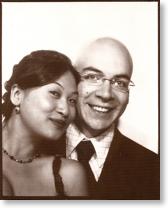 We graduated with various honours & post-graduate Engineering degrees and married shortly thereafter, honeymooning in Paris, Madrid, Stuttgart, Leipzig, Osaka, Singapore and a few other locales along the way. After living in the city of Adelaide for a few years, flirting with international career postings & working in diverse fields such as micro-electronics, defence & aerospace, software engineering, music performance and motion-picture visual effects, we set off to stake our claim to the stereotype of global nomadic professionals and we've been having a great time exploring the globe ever since. Dominic is employed by Pixar Animation Studios (acquired by Disney) in Emeryville, California and claims to be a colour scientist. He's often seen piss-farting around, scratching his head, gingerly pushing buttons & causing trouble though occasionally he sets his mind to "making the world a better place"™ with Colour, Math & Lasers. Zoe was lured to the bay area in January 2006 by Lucasfilm Animation at George Lucas' ranch in the secluded hills of Marin county, California. She has contributed to a bunch of Star Wars™ franchises, flexing her large brain to help the company optimise complex data/people/computer combinations & is now happily consumed by Shotgun Software who are based in Los Angeles, yet are happy to siphon whatever bits she can dedicate to the wire. We have three beautiful daughters; Zara Eloise born June 2008, Beatrix Allegra born August 2010 and Willow Fae born January 2013 who consume our every waking (& often sleeping) moment. Dominic has climbed Mount Everest .. and has the photos to prove it. We drive a hybrid electric car ... but only partially because we're 21st century hippies. We are collectively owned by a sleek & sooky, mature bengal cat who we rescued from an animal shelter in 2007. We both play baroque violin ... and listen to acid, electro & detroit techno. ACME walnut & cranberry loaf with Mt Tam brie, organic strawberries, kalamata olives, corasley bashed black pepper, avocado & fuji apple.